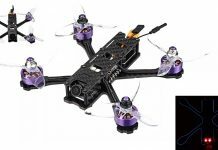 This week, Realacc (subdivision of Eachine brand) announced their second micro FPV brushless quad with an even more interesting design. At first look, the Realacc Scops 100 seems to be a tri-copter but, considering that the two rear motors are one over another, it is a classical quad-copter with Y4 design. 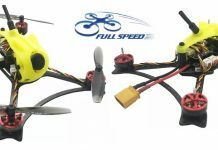 Measuring only 120 x 120mm x 65mm you might think that the Scops 100 is proper for indoor flights, but in my opinion brushless quads are suitable only for large outdoor spaces. In front of the Realacc Scops 100 drone is located a 600TVL camera with angle adjustment. The camera is paired with a 5.8G 25mW VTX. Frsky D16 mode SBUS receiver (Smart port ready). The 6000KV brushless motors are equipped with 5-blade propellers. Being powered by a 3s 550mAh Li-Po battery, the advertised flight speed of the Realacc Scops 100 is about 3 – 4 minutes. About 3-4 minutes of flight time. 3s 550mAh 40C Li-Po battery.